President Trump declared in Singapore at 4 a.m. 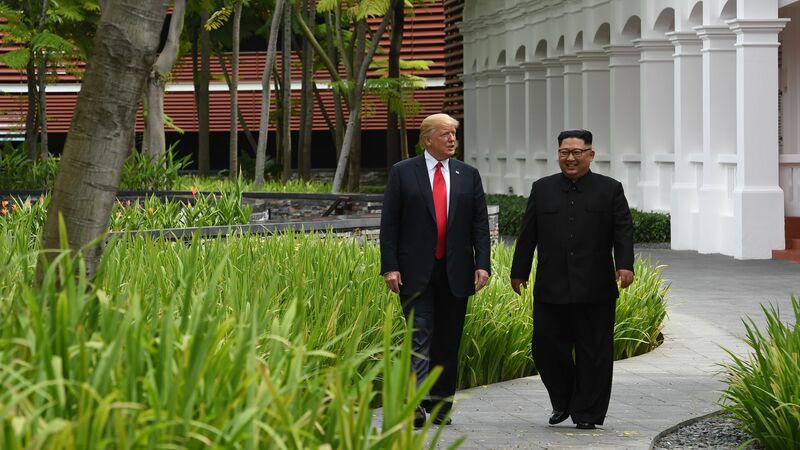 ET that "real change is indeed possible," after a stunning summit with North Korean leader Kim Jong-un that was much longer on symbolism than substance. What we're hearing: Ian Bremmer of Eurasia Group tells me, with his trademark punctuation, that the summit "benefits north korea more than the united states ... this is the same fuzzy formulation on 'denuclearization' that they promised the south koreans during their two summits." Bremmer adds that Trump has "made history with the summit. and the risks around north korea are much lower than the fire and fury days." "next big summit: probably putin." Before heading to the airport, Trump began an hour-long news conference by saying: "It’s my honor today to address the people of the world … I stand before you as an emissary of the American people to deliver a message of hope and vision, and a message of peace." Trump said officials from the two sides, including Secretary of State Mike Pompeo and national security adviser John Bolton, "get this stuff done. We want it to get it done. He wants to get it done ... get the ball over the goal line." "Peace is always worth the effort," Trump said. "For seven months, you haven't had a nuclear test. You haven't had a nuclear explosion." Trump mimicked press skeptics, then declared: "I gave up nothing. I'm here. I haven't slept in 25 hours." Trump said he showed Kim a video (he originally called it a cassette) on an iPad painting a picture of the future that was possible for North Korea ("super everything"). That movie trailer-style video, ending with the declaration "The future remains to be written," played in Korean and English before the presser. "As an example, they have great beaches. You see that whenever they're exploding their cannons into the ocean, right?" Trump said at the news conference. "Wouldn't that make a great condo? ... You could have the best hotels in the world right there. Think of it from a real estate perspective. You have South Korea. You have China. And they own the land in the middle. How bad is that? Right? It's great." Trump told Fox News’ Sean Hannity in Singapore, in an interview airing at 9 p.m. ET: “We are now we are going to start the process of denuclearization of North Korea ... I believe that he’s going back and will start it virtually immediately." Be smart: This is a long way from the "Little Rocket Man" and "mentally deranged U.S. dotard" insults of last year, and the legit fear inside the West Wing that America could be on the brink of war. But the summit bought Trump time, rather than guaranteeing denuclearization of the Korean Peninsula. Axios' recap of the summit's big events. The details from Trump's post-summit presser.